Comfort is one of the most important things to consider when choosing a new pair of headphones, especially if you will be wearing them for long periods of time. If you have large ears, it can be even harder to find a pair of over-ear headphones which don’t cramp your ears. In this guide, I have identified the specific problem of finding comfortable headphones for big ears. 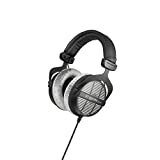 I also talk about the different types of headphones to choose from, and finally, I have some recommendations for over-ear headphones that users with big ears have found to be very comfortable. In-ear headphones – as the name suggests – are the small headphones which sit in your ears like the Apple Earpods. Generally, the size of your ears doesn’t really affect the comfort of these headphones. On-ear headphones and over-ear headphones might look quite similar, but there’s a big difference, especially when you have big ears. The earpads of on-ear headphones sit on top of your ears, so like with in-ear headphones, the size of your ears doesn’t really matter. 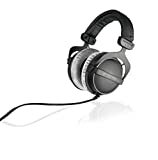 Over-ear headphones, however, have cups which go over your ears (hence the name), and if the ear cups are quite small – which they are on many models – they can be painful to wear if you have large ears which don’t quite fit inside of the cups. So basically, you shouldn’t have any problems with any in-ear or on-ear headphones if you have big ears. But if you want a pair of over-ear headphones, make sure you choose some which have large ear cups like the ones I recommend further down the page. Now we’ve identified the problem with finding headphones for big ears, let’s look at some of the other factors to consider to find the headphones that best suit you. In-ear vs. on-ear vs. over-ear – I know I’ve already talked about how these are affected by large ears, but I also want to talk about the pros and cons of them. In-ear headphones are the best option for portability. You can easily pop them in your pocket and they are great for when you’re exercising. The downside is that the audio quality is not that great. On-ear headphones cover the middle ground. They’re fairly portable and usually have reasonable sound quality. Over-ear headphones have the best sound quality and noise isolation, but they are the largest type. 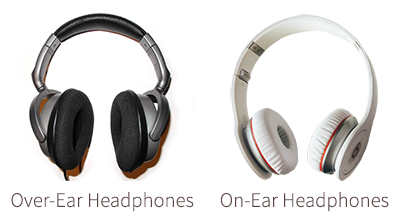 Open-back vs. closed-back (over-ear) – There are two types of over-ear headphones. Open-back headphones allow air to pass freely through the ear cups. This gives them a more natural, airy sound. Open-back headphones don’t provide any noise isolation so aren’t great for noisy environments. Closed-back headphones have a more full and bass-heavy sound. They also provide more noise isolation than open-back headphones, and some models have active noise cancelling which really helps to reduce outside noise. All of the headphones below have larger ear cups and are known for their comfort. Obviously, everybody’s ears are different, so it can be hard to find the best fitting headphones for yourself. But these headphones have been praised in forums and reviews by people with large ears who have struggled to find comfortable headphones. 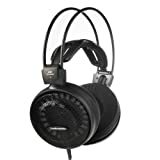 I have made sure to search for headphones of various prices, so you should be able to find a good pair, regardless of your budget.